It is no surprise to see a continuous rapid growth on the usage of social media networks. And businesses are taking this opportunity to sell their products or services on popular social media networks, such as Facebook. When it comes to the creative aspect of your Facebook Ads, take note of that it doesn’t really has to be about the promotion itself. A lot of people jumble up on this part of the creative by setting up an ad campaign and telling their graphic designer that they need a picture of the product or service that looks great. While using a picture of the product or services may work at times, but that’s not generally what’s needed for a high-converting campaign. Start getting the mindset of the picture and videos creative is just the visual elements that ought to support your campaign all in all. Make sure your creative reflects the marketing message or hook about the message you’re using to sell or to get someone to take action of your campaign. That’s a lot of consideration that goes into this process. 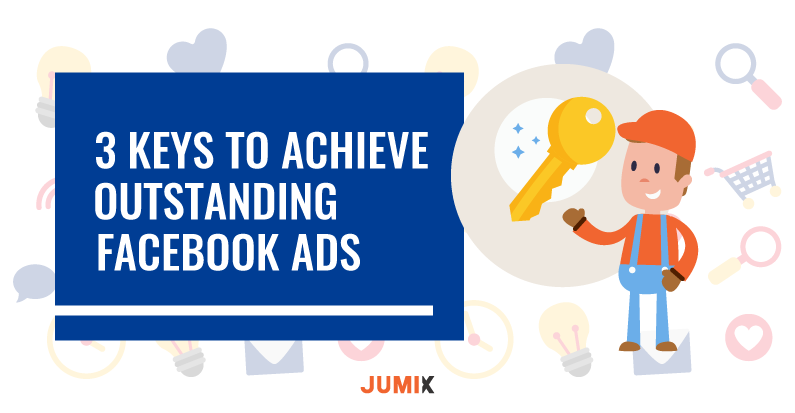 Let’s look at some of the important keys to get an outstanding Facebook Ad Image when you’re working on your creative path. The simplest guideline for all Digital Marketers is to go with different font styles and attracting colors a brand. The more ads you run, the more your ad is going to reach people and more people are going recognize your brand. Therefore, as a marketer you have to ensure your pictures have something truly standout across all your competitors. When you start running a different ad that looks different across different campaigns, audiences are not going to recognize your brand because you you’re lacking identity. Always go for contrasting colors, otherwise primary colors, try to not mix different palettes because the chances of it turning out messy is high. Make sure to go with colors that resonates with the brand. Check out color psychology to learn more on how colors could influence one’s perception about your brand. Play off with emojis ??? This is something that works well, and it has been figuring out that you can play off those emoji that which associations people in their common lifestyle. As of now, what kind of icons or pictures do people have a relationship with? For example, you running an ad demonstrating an iPhone battery that was low, to remind people about the status of their iPhone battery. Whenever people see the ad it will automatically bring remind them about their mobile devices. The usage of using emojis makes a post look and feel more informal and ‘humanize’. People do not want to read a bunch of formal words every day, hence emojis can help bring captions or write-ups to life. At least, they are expressions that are more familiar of. Although if might not prefer to use creatives design for the sole purpose of standing out, there are some ways to stand out in the news-feed. A video ads or GIFs can also be used to catch people’s attention because they showing an animation. It will lead the audience to stays long in order to get more information of our promotion as well. Besides that, try to tell a story about how your offer can change or affect people life. Carousel ads are a great way to tell a story using your creatives image and color to create an outstanding Facebook Ad. Either focus on your content description or creatives to capture people’s attention. If you convey the marketing message while making it a little flashy, but still on brand, that’s great. If you’re running an ad with image in the news-feed and it doesn’t stand out, you’re probably going to have trouble because it’s going to blend in with everything else.